NUMC is the charter organization of BSA Troop 370 and Pack 170 which serves Sandy Hook and Newtown. Both have regular meetings at the church and work to provide service hours for the church annually with their 100± membership of youth. 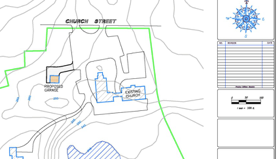 Troop 370 and Pack 170 are requesting that NUMC provide an area on the Church property to establish and build a permanent structure, ‘The Shed’, to house the gear and trailer for the BSA organizations. Troop 370 has outgrown and is losing its current shed, and Pack 170 has never had a permanent storage facility. The current Troop 370 shed is slated for destruction, as it sits on the property slated for the 12/14 Permanent Memorial. Pack 170 materials are in temporary storage at the Sandy Hook Volunteer Fire and Rescue Station. The Troop and Pack are requesting the 34’ x 26’ barn-like structure be built and maintained by Troop 370 and Pack 170. The final completed structure would be owned by NUMC. The Troop has proposed minimal tree removal for the construction site and driveway. The proposed site has been marked with pink ribbon on the west side of the property. Plans for the new Troop 370/Pack 170 shed were presented and subsequently approved by the NUMC Trustees on May 14th and the Church Council endorsed the Trustees approval at their August 20th meeting. The Troop and Pack have finalized design specifications and materials with the guidance of the Trustees and the Council. The Troop and Pack will establish permits for construction September/October 2018. Construction would commence in Fall/Winter 2018 – 2019, with a June 2019 ribbon cutting ceremony celebration. The Troop and Pack have committed financial resources to the building of the new shed. The Troop and Pack have also received donations of finances, professional services and materials for its construction. Troop 370 and Pack 170 are excited to have a permanent home for their gear and materials, and greatly appreciate the support of NUMC in this endeavor. By supporting this project, NUMC and BSA will be fulfilling their commitment to their organizations and to the larger communities they serve. NUMC, Troop 370 and Pack 170 will be viewed as growing invested partners of Sandy Hook, Newtown and the region. The membership of NUMC, Troop 370 and Pack 170 will renew bonds and commitments to their organizations. If you have any questions about this project, please contact the NUMC Trustees or Rob Sibley at (203)364-7090 or thesibleys01@gmail.com.